Schroth Seat Belt Harness Pads If you have a set of Schroth or other racing harnesses these pads are a must have as the belts commonly cut into your kneck. These pads will keep your neck from getting cut up. These pads can also be put on the stock belts for added comfort and style. These pads are quality made with one side zipper to install and attach to the belt. If you are using them on factory 3-point restraints, you can use one pair giving you one pad for both driver and passenger belt. 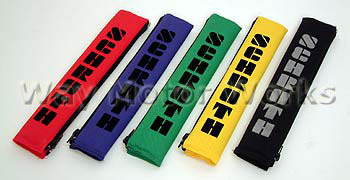 Schroth Pads come in color with Black SCHROTH Lettering on each pad. Comes in Red, Blue, Silver, Black, Yellow, and Green. Green and Yellow are special order so they take a few extra days to get to you.